It's a busy time right now, with the holidays and all, and I am sure that you can relate. I wasn't able to go in to the museum last week due to a bad cold, and have been catching up on various illustration work. I don't have much right now but can share some more photos from the collections. 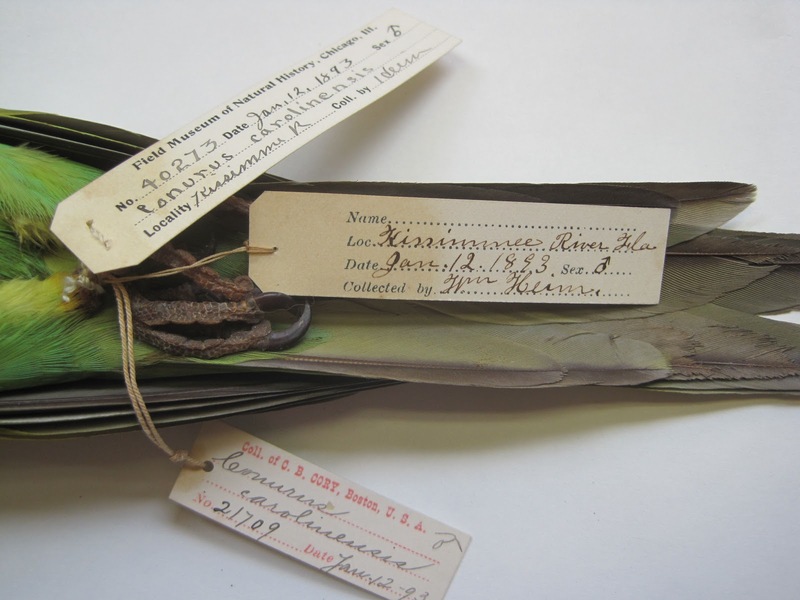 The two photos above are of a Carolina Parakeet Conuropsis carolinensis specimen from the Field's collection. As you can see from the tags it's from 1893. The Carolina Parakeet was extinct in the wild by 1905. When I looked at this specimen it's roughly the size of a Monk Parakeet. Monks, also known as Quaker Parrots, are a species of parrot that have been introduced in the wild here. They have established several feral populations in various U.S. cities like Chicago and Austin. I've seen Monks in both of those cities, and every time I spot one, I think of the Carolina even though they are two very different species of parrot. Monks are from the genus Myiopsitta and is native to South America. Conuropsis carolinensis is from the genus Conuropsis and was native to North America. Carolinas could be found from the Ohio Valley down to the Gulf of Mexico. They needed old growth forests as they were tree cavity nesters, and they feasted on plants such as thistle and cockleburs. They also loved to dine on fruit and corn. For this they were considered an agricultural pest, and were killed by the thousands by farmers. 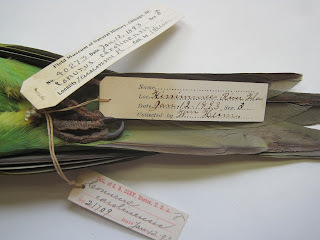 The next time you take a hike and come home with cockleburs stuck to your clothing, or the next time you have to brush them out of your dog's fur, give a thought to what was our only indigenous parrot here in the States. What beautiful colours, the yellow, turquoise and grey. Sadly gone. We have some parakeets wild in a park nearby, I have yet to see them, apparently they are loud! I live in Austin and have seen these parrots in my backyard trees! Very strange to see (and hear!) these birds. I thought at first they were someone's pet but found out they lived here! 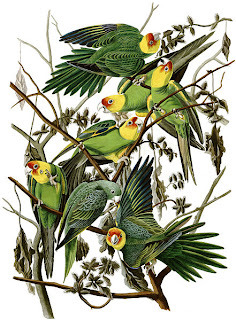 So sad these parakeets were decimated. 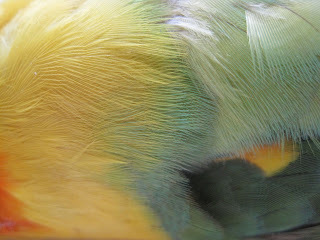 Those layers of colored feathers just killed me! @ Julie Clay: what you have in your park there quite possibly are Monk Parakeets, as there are established populations in Europe as well. Yes, they are quite loud! @Rebecca: it's possible they were once someone's pet! Monks were brought to this country via the pet trade, and the thinking is that these feral populations were established by escaped pets or people deliberately setting them free. I've so enjoyed watching the parakeets (not sure of their provenance) in a giant nest inside a cell phone tower near my Humboldt Park office. It gets me thinking about how migration may differ from displacement, but above all how adaptable the breed (right word?) seems to be. Thanks for the lovely post.